1 May 2009 -- World Health Organization is not recommending travel restrictions related to the outbreak of the influenza A(H1N1) virus. The application of dynamical systems theory to areas outside of mathematics has proven to be an exciting and fruitful endeavor. These applications are highly diverse and interdisciplinary, ranging over such fields as Biology, Chemistry, Physics, Engineering, Finance, and Industrial Mathematics. This conference strives to achieve a good mixture of applications and the mathematics that informs them. The goals of the meeting are a cross-fertilization between the different fields of the applications, and increased communication between the mathematicians who build the theory and the scientists who use it. 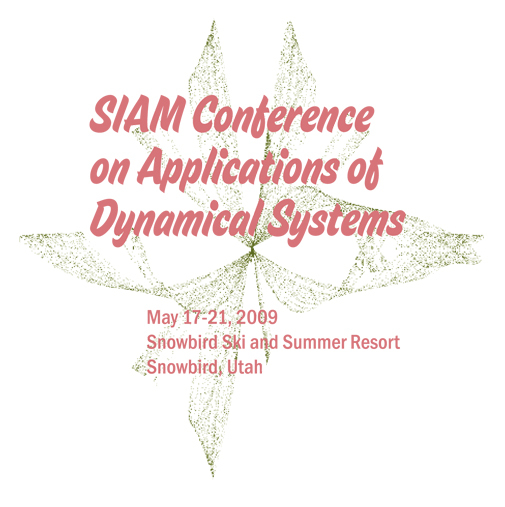 The scope of this conference encompasses theoretical, computational, and experimental research on dynamical systems. Highlighted areas are climate modeling, biological systems, engineering systems, Hamiltonian systems, stochastic systems, networks, uncertainty management, pattern formation, and fluid dynamics.